The House Republican leadership has begun circulating a draft tax extenders bill and as we predicted yesterday it is full of the kind of special interest favors that show Washington insider cronyism at its worst. Special tax breaks for race horse owners – they’re in there. Special tax breaks for motorsports race track owners – in there. Special tax treatment for film and television production – a group no sensible Republican should want to help based on their overwhelming support of the Democrats – of course it’s in there. Especially egregious are the “green energy” giveaways that benefit Democratic donors and interest groups at the expense of America’s hard-pressed families. There’s hardly a “green energy” crony that doesn’t get a break or a tax credit in the Republican version of the tax extenders bill, so imagine how many bags of loot the Terry McAuliffe clones will be carting off from the Treasury in the Senate version of the bill. Here are the numbers on one of the worst outrages in the bill – a two-year extension of the wind production tax credit (PTC) would cost taxpayers $13.55 billion over the next decade, giving away billions of taxpayer dollars to organizations like the wind lobby (AWEA) and the League of Conservation Voters, who just spent tens of millions of dollars trying to defeat Republicans in the midterm elections! Wind power simply doesn't make economic sense without the PTC. The wind PTC contemplated in the bill is so generous that wind developers can often pay the electric grid to take their power and still turn a profit—forcing nuclear and coal operators to lose money on their operations. That’s right – some wind operators are paying utilities to take their production because taxpayers are in effect guaranteeing them a profit – it’s called negative pricing and it is made possible by DC cronyism at its worst. The wind PTC also plays a large role in Obama’s discredited global warming agenda—specifically the EPA’s proposed regulation of carbon dioxide emissions from existing power plants. One of the central “building blocks” of this regulation is increased use of wind and solar for electricity generation. But you can’t run a steel mill on a wind mill, and wind and solar are uncompetitive without massive taxpayer subsidies—for wind, that takes the form of the PTC. Thus, extending the wind production tax credit is crucial to the president’s climate action plan – which coal state Republicans like Kentucky Senator Mitch McConnell and West Virginia’s Shelly Moore Capito just campaigned against. But don’t count on them to vote “NO” on the tax extenders bill unless you call them and demand an end to this outrageous raid on the public purse. You’d think that the GOP leadership would get all of this (especially the Obama global warming agenda and green energy interest group part) and at least be politically smart enough not to fund their enemies, even if they won’t oppose these raids on the Treasury strictly on principle, but since the election intentional stupidity has been the order of the day with Boehner, McCarthy and Scalise in charge of the House Republican Conference. Here’s a link to the draft bill that was circulating late yesterday. The Capitol switchboard is 1-866-220-0044. We urge you to call Capitol Hill Republicans, especially those on the House side and Senators from coal states. 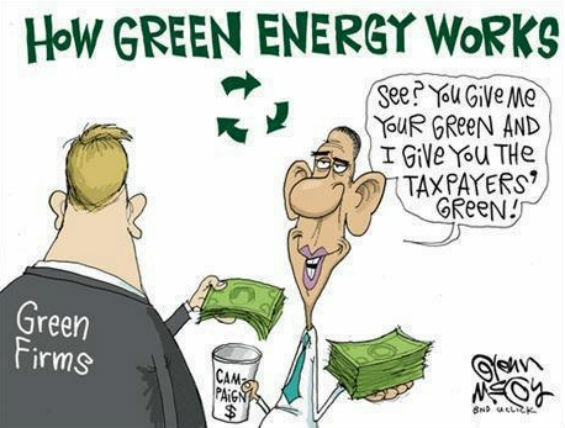 Tell them they must stop this DC insider raid on the Treasury and Obama’s global warming agenda by removing the wind production tax credit and other green energy giveaways from the tax extenders bill. Submitted by sir_aslan on Fri, 12/05/2014 - 22:35.